One of the great things about being an SU Demonstrator is that you get to meet a lot of lovely people who share a common interest. I was able to attend the Hobart Field Training Event this month with Tania and Leonie. It was a fun night where I gathered some wonderful ideas, techniques and got a sneak peek at some of the new Summer Mini products (I now have a copy and it is 'gob smackingly gorgeous'). We're not allowed to post pictures on our blogs until the pre-order release date (3rd November). I can't wait to show you the cute samples that we made in Hobart, and when I get up from typing this, hopefully I will have time to go and create some more! Thankfully it's a long weekend here in Northern Tasmania. Here's the Swaps that I received from a bunch of very talented people. Tania Gould, Lynda Moss, Julie Leeper, Claire Harrison and Sharon Walsh (Credereshaz.blogspot.com). 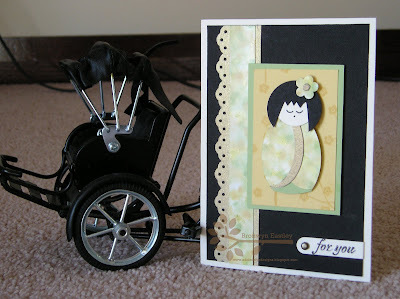 Tania, now has her own blog (Time for Me; Time for You) and she has just posted her very first card. Why don't you drop by and check it out! PS: My addiction is stamping but it is also therapy for my addINKtion. 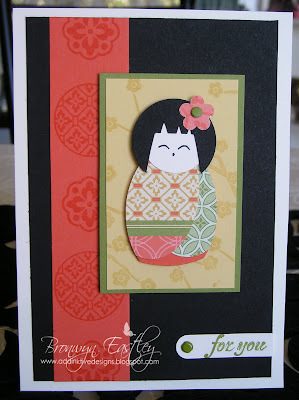 Here's the 'Polished Stone' version of my Japanese Doll Card. I kept the general layout and added some Brushed Gold card stock to the kimono and to the punched Eyelet Border. 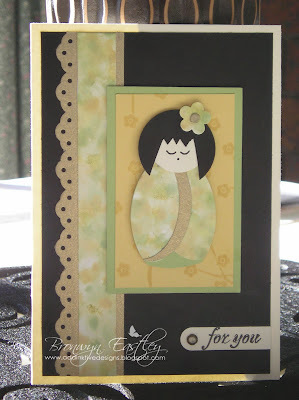 The PS border and kimono have been done with So Saffron, Certainly Celery and Gold re-inkers. The little pedi-cab is all the way from Cambodia, courtesy of my hubby, who went there last year on a Mission Trip with the church we attend. Here's the four different styles of dolls that I made for my Hobart Swaps. They were a lot of fun to make. I'll be showing a large group of ladies, at the TEAR Fundraiser tonight, how they can make their own! Ok! So the 'twenty something' one was not as much fun to make as the first! Phew! I finally finished. Now I just have to put the Project Recipe on the back. 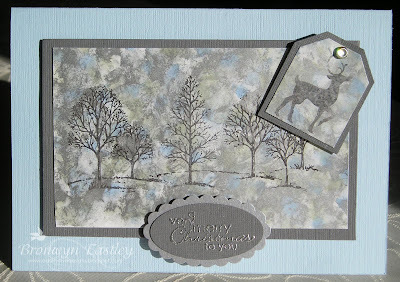 If I get time, I'm anxious to make some more swaps using the Winter Post stamp set. I'll see how things go. The motivation is there but there's only 24 hours in a day! This little cutie has the same Project Recipe as the earlier post. There's just a couple of things to add - I used Circle Circus Stamps in the Tangerine Tango border to match the Haiku DSP and the hair is made with the 1 1/4" circle punch. That's the end of the Japanese Doll Card Parade for now. I hope you enjoyed browsing and have been inspired to do some 'creating' of your own! 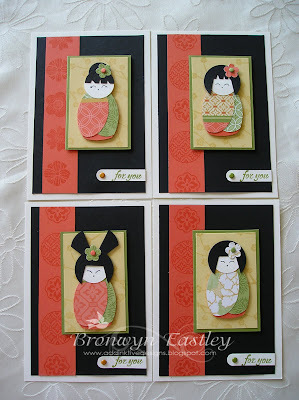 Click here for the Japanese Doll instructions on Kirsteen's Blog. A correction needs to go on the Project Recipe for these - I incorrectly put that I used a large oval punch. It should have said WIDE OVAL PUNCH on the Swaps. Apologies to anyone that was confused by the error! Laura and I had a quick browse around the Launceston Show, before collecting the craft entries at the Cottage Industries' Pavilion. The ONLY reason I went was to see the crafts on display. The whole other experience reminded me why I hadn't been for about 8 years and why I'm not likely to hurry back! I discovered that the 'Alpine Express' gives me a headache and everything is so over-priced! Well, despite all this, it was great to see the children's work. I have lots of certificates, ribbons, money and prizes to give out at the next Assembly. Well done to everybody and to Mrs. Pannowitz, who spent a lot of time with the Seniors cooking up a storm! I got a real surprise to see I had won overall winner in the Papercraft Section and was awarded a book voucher from Petrachs (my daughter is very envious). I wonder if they have some books on papercraft? Time to put my feet up with a home brewed coffee! Isn't she adorable? 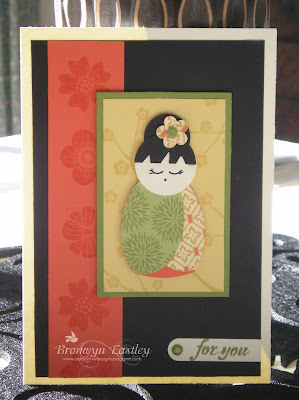 I was browsing Splitcoast Stampers on the Web the other night and came across a very cute card featuring a little Japanese Doll. 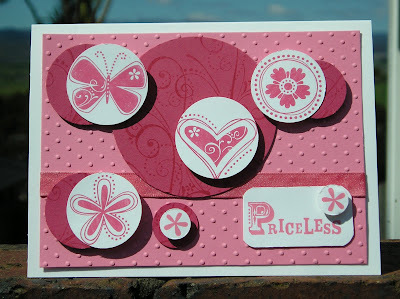 She's made from the wide oval, 3/4 " and one inch circle punches, along with some cute Designer Series Paper. I just had to try it out for myself using the Haiku DSP. It was such fun to make, that I decided that this would be one of my Swaps for Hobart Field Training. I don't think I'll get tired of making them, as each one will end up looking a bit different. They'll have different hairstyles and kimonos and I might substitute the 'Eastern Blooms' Stamp Set for 'Circle Circus' to see how that looks. I also made one that has a 'polished stone' kimono etc. I'm keeping that one for a future post, along with other sample cards that I'll make using the same technique, for my demo in Hobart. I had better get off the computer and get ready to go the Launceston Show. Apparently I have some prize money to collect!! Mmmm.. no guesses as to what I'll put that towards.. a new stamp set, perhaps? 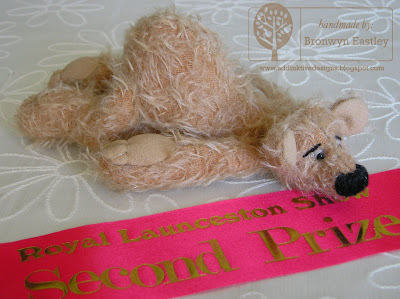 My tri-shutter card won 1st prize and Little Uggles the Bear, came 2nd. Wooo.. hooo! The last time I entered a competition, I was in grade 2 and I got Equal First Prize for my short story. I can remember that I wouldn't let the author scribble her name in my nice new book that I received and my sister being annoyed with me. That's one time I should have listened to her advice. 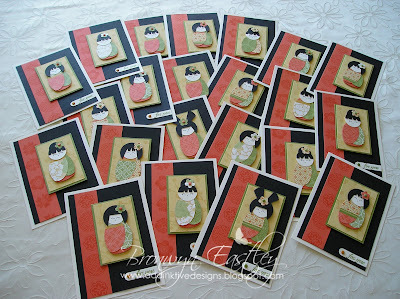 Stay in touch for some more cute Japanese Doll cards. 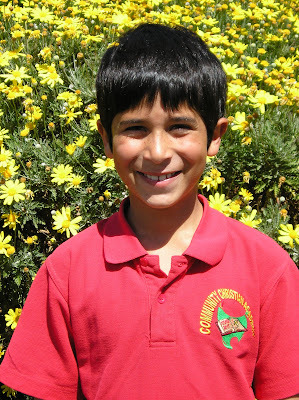 Sanji (in grade 3 at Community Christian Academy), along with his mum, is holding a special Stampin' Up! evening to raise funds for a Community School. He has raised $290 so far and needs a total of $550. 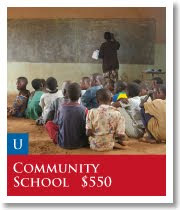 This money will help provide teacher training, salary and running costs of a school for a year. This is your invitation to attend the evening (if you live in, or around the Launceston area). The cost is $5 which will go towards the Community School. I will also donate my commission from any Stampin' Up! sales on the night. Supper is also included. Sanji is going to cook triple choc brownies and give away some prizes. He will give a short presentation to explain his project on the night. 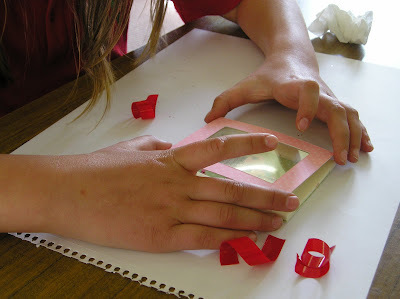 I will, of course, provide a fun Make 'n' Take activity too! Please RSVP to secure your place and so we can prepare appropriately. 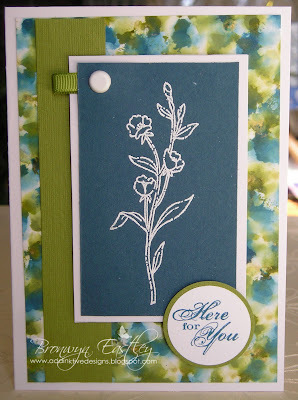 If you can't make it on the night, but have been wanting to put in a Stampin' Up! order, you can e-mail it to me before the 17th October. Please indicate that it is for Sanji's fundraiser, so the commission from any outside orders can be donated to this awesome cause! 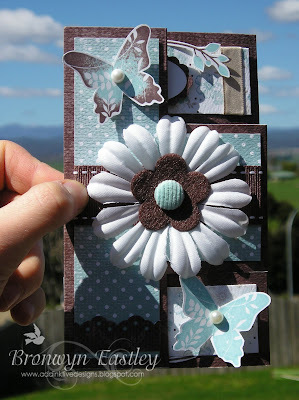 Here's a pic of Jenti's finished card for the Launceston Show. It's definitely 'Priceless'. The colours, Regal Rose and Rose Red go so well together. I love the layout of this card. Hasn't she done a fantastic job? 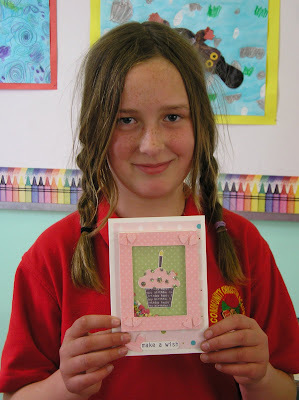 Here's the gorgeous card that Bianca made for the Junior Craft Section at the Launceston Show. 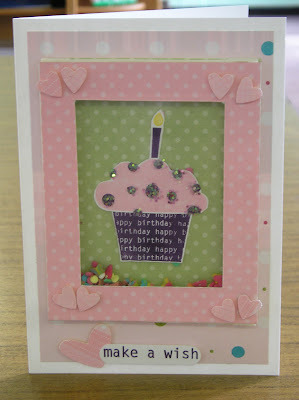 It's a 'Shaker Card' filled with cake sprinkles, behind the clear acetate window. 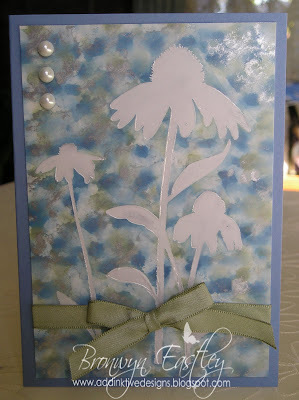 She used the 'Big Bold Birthday' Set and glued 'Crystal Iris' chunky sprinkles to the 'frosting'. It makes my mouth water just looking at it! Yay! It's finally finished after 2 days! It's a bit hard to tell from the picture, but Bianca put the lower part of the cupcake through the crimper so it looks like a real patty pan. 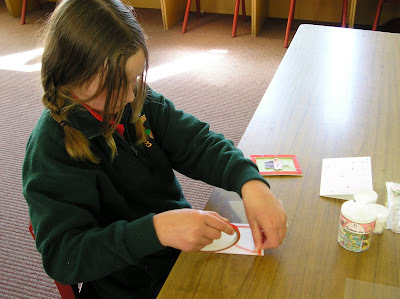 Placing the 'window' down onto the foam mounting tape was a bit tricky. Sticky strip will hold all the cardstock, acetate and Designer Series Paper together! I love my job, especially when I am able to do my favourite hobby with the children. 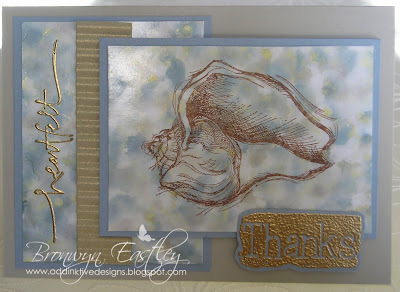 We marbled paper for Mother's Day cards this year and I've recently featured what we did for Father's Day. I'm looking forward to making some Christmas 'goodies' with the students. 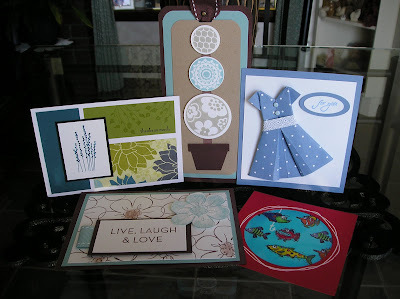 It's great being involved with Stampin' Up! 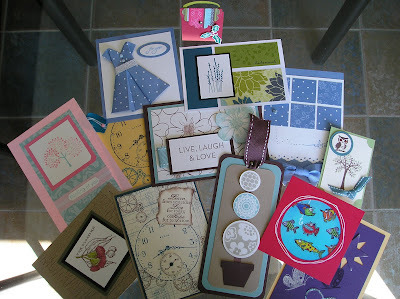 as I'm never short of having craft ideas on hand, as well as all the great resources that the Company offers. Hopefully, in the next day or two, I'll be able to share my entries for the Show. I'm a bit distracted tonight though, because I came home to a recorded message on my answering machine. 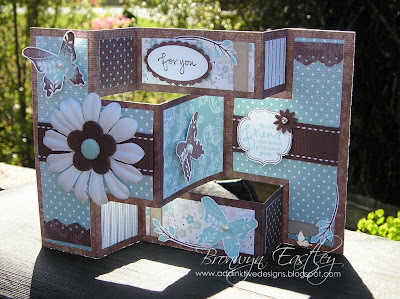 It was Stampin' Up! wanting to know if I'd do a 'Workshop Wow' Presentation at the Hobart Field Training Night! Scary thought, but I'm feeling stoked about the opportunity! I guess my feet will come back to Earth sometime soon.